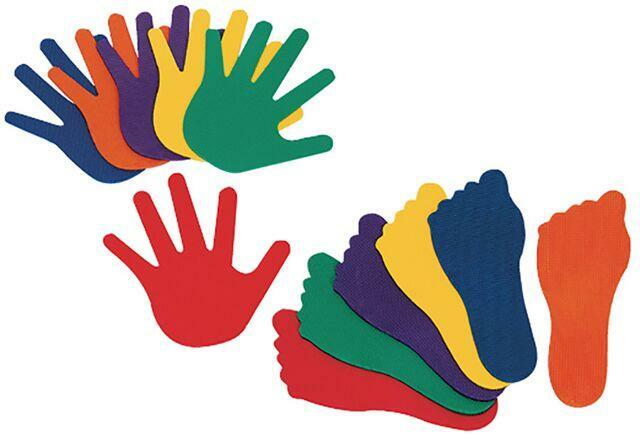 This 12-piece Hands & Feet Play Markers provide a comfortable alternative to sitting on the floor. Combine movement activities and cognitive skills easily with Hands & Feet. Colorful teaching aids direct movement activities to reinforce active learning of shapes, colors and right/left differentiation. Durable poly vinyl is skid resistant. Set of 6 pairs in each with assorted colors. Dimensions: Hands - L: 7.5" x W: 7.5" Feet - L: 9" x W: 3"